This guest post was written by Artem Livshits, CEO of OblakSoft, which makes the ClouSE MySQL storage engine for cloud development. In this post, Artem describes his experience using Google Cloud Storage to store and serve a WordPress blog. WordPress is popular blogging software used by over 60 million people. If you have a WordPress blog, you want to ensure that your server load is manageable and that your load times are fast. You also want your data to be protected in case your server fails. With that in mind, we at OblakSoft created the Cloud Storage Engine for MySQL (ClouSE). It stores all your WordPress data on Google Cloud Storage, taking the load off your server to improve reliability and speed, and to reduce hosting costs. The website’s content management is done through WordPress, which uses a MySQL server to store the website’s data. It uses the WP2Cloud WordPress plugin we created to upload pictures (and other media files) to Google Cloud Storage. ClouSE makes the web server stateless by storing all data in Google Cloud Storage using the Google Cloud Storage API. Web pages (lightweight HTML) are served by WordPress, while media files are served by Google Cloud Storage directly. Keep the data highly available and highly durable. Serve media files in a highly scalable fashion. Distribute media files across the globe for fast access. This solution works with any hosting provider, so our users can keep their current hosting arrangement, and move their data to Google Cloud Storage using WP2Cloud and ClouSE. Users who are limited preview customers of Google Compute Engine can get started immediately using a fully configured WordPress image that we created. We’re very excited about the potential of the Google Cloud Platform to power dynamic web server applications. Launch your own WordPress site in the cloud today - it’s easy and there’s minimal setup. We found it easy to make ClouSe work with Google Cloud Storage, and you can see how you can integrate Google Cloud Storage into your app as well. Artem Livshits is the Founder, CEO and software architect at OblakSoft, a company focusing on technologies that simplify adoption of cloud computing. Previously Artem led the development of several server products from inception to maturity during his 12 years at Microsoft, including the source control system managing most of the Microsoft code base. I can't figure out from all the marketing talk - how is this different from a CDN? It sounds just like a push CDN. Content distribution is a great property of Google Cloud Storage, but this is just one aspect of the WordPress-to-Cloud solution. 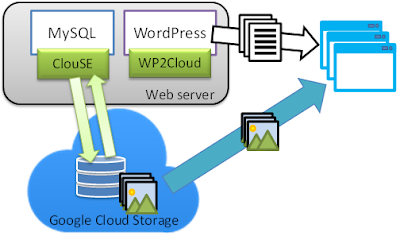 The WordPress-to-Cloud solution uses Google Cloud Storage as the *primary* storage. Unlike CDN-only solutions, where the master copy is stored on the webserver while merely being replicated to a CDN for distribution, in this solution it is Google Cloud Storage that stores the master copy of the website’s data. As the website’s data is stored in Google Cloud Storage, the webserver becomes stateless. Which is great for high availability: should the webserver fail, the recovery is fast and robust – just start a new webserver from a static machine image that contains only the software. This is the kind of recovery that compute clouds (such as Google Compute Engine) do extremely well – the instance is automatically restarted from the original machine image. If you are a limited preview customer of Google Compute Engine, you can use our ready-to-run WordPress image for Google Compute Engine. The ready-to-run WordPress solution takes full advantage of the cloud resources: Google Compute Engine provides compute power and keeps the webserver highly available, and Google Cloud Storage stores the data extremely durably and distributes media files. We’re looking forward to general availability of Google Compute Engine, and we think that with ClouSE and WP2Cloud, Google Compute Engine + Google Cloud Storage can provide a perfect (i.e. highly-reliable, -scalable, -available and globally fast) hosting platform for websites, including ones powered by WordPress. Should you have any questions, feel free to email us at info at oblaksoft dot com. Is this available only for Apache? What if your host is running Litespeed? The solution should work with Litespeed as well as with any webserver software that is supported by WordPress. The storage configuration is actually transparent to WordPress. 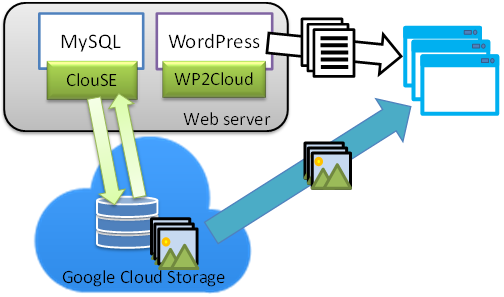 WordPress stores the website’s data in MySQL, while ClouSE is plugged into MySQL and places all data into Google Cloud Storage, rather than using local disk. ClouSE plays the role of a database gateway for Google Cloud Storage, combining the best of local and cloud storage by delivering performance and security of local storage, plus all the benefits of Google Cloud Storage. The key advantage of this architecture is that the whole MySQL-based ecosystem continues to function as before with no change, with data located on Google Cloud Storage. This means you have the same choice of webserver, MySQL, and etc. software and tools – all the things that you know and like. Definitely try Litespeed with WP2Cloud and ClouSE. Let us know how it goes at info at oblaksoft dot com. According to you which one is more suitable for any database management website? You have written step by step guides for launching an entire WordPress website on Amazon S3 cloud storage. I tried hard to find this kind of useful guide for installing WordPress website on Google Cloud storage but not find any. I request you to make such tutorial for Google Cloud Storage as well. That's a great idea, thanks! We'll create a tutorial for WordPress on Google Cloud Storage soon. I have a couple of questions: 1) How do you access the database if it is in the cloud? Does Google have something like phpMyAdmin for this? 2) How do I upload new and edited php and css files? Does Google have a tool for this as well? Thanks in advance! ClouSE is plugged into MySQL and places all data into Google Cloud Storage, rather than using local disk. So from the usage standpoint, it is still good old MySQL that you are running on your database server or webserver. As such, you can use any and all MySQL tools that you find useful, including phpMyAdmin. We’ve released a ready-to-run WordPress machine image for Amazon EC2 with phpMyAdmin and Webmin installed and configured (see http://www.oblaksoft.com/wordpress-on-s3-going-professional/). It actually can use Google Cloud Storage, though it’s most natural to use it with Amazon S3. As soon as the Google Compute Engine becomes generally available, we will have a similar offering for Google Compute Engine. If you have access to Google Compute Engine Beta, we have a script (available at http://www.oblaksoft.com/downloads/) that you can use to launch an instance to Google Cloud today. Should you have any questions, don’t hesitate to contact us: http://www.oblaksoft.com/about-us/email-us/. This is all very interesting, but one very big question is, what is the license for this? Is it open source? Is this viable as a free (community) product for startup commercial sites? Beta version of the Cloud Storage Engine (ClouSE) for MySQL is free. License pricing for the GA build of ClouSE has not been finalized; the plan is to keep it comparable with what customers pay for the backup software today. Please contact us for details: http://www.oblaksoft.com/about-us/email-us/. Unlike the existing backup approaches, with ClouSE you actually don't need a backup, as the highly durable and available cloud storage is used as the primary storage for the website. The website data is instantaneously (as opposed to the once a day or a week) protected, recovery happens in seconds, and the website is effortlessly faster as the site’s media files are served by highly scalable cloud storage rather than the webserver. The WordPress Development instance is completely stateless, as all the data saved in Google cloud Storage space. WordPress is one example of a MySQL-based program, which now can be designed to run in the Google cloud and make use of the cloud services. Sir, If I learn a WordPress Tutorial site. can it will be harmful? thanks Artem Livshits it's really good information.